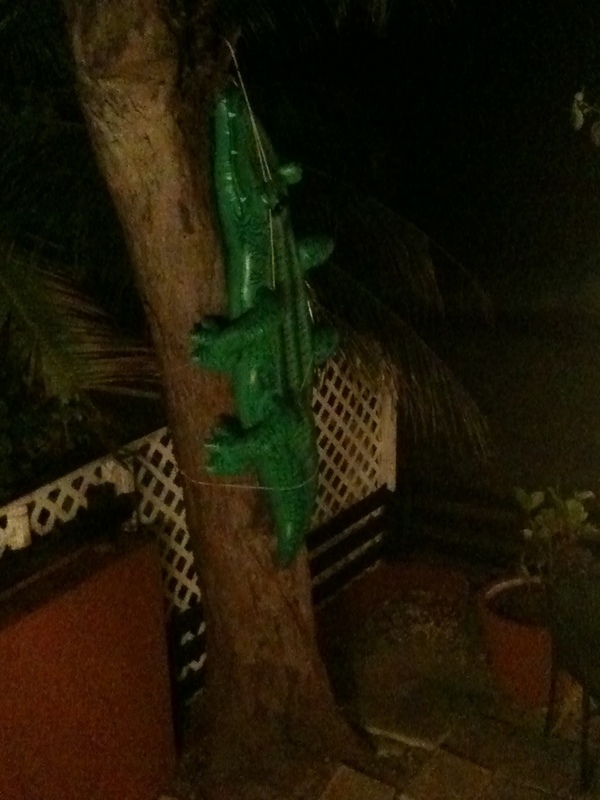 …on why there is an inflated plastic alligator strapped to an almond tree outside our balcony? … or is it part II? I dunno. I’m on island time now! We arrived late Friday afternoon after being delayed by over an hour in Toronto due to the ol’ de-icing routine. Unpack. Get essentials from shop down the street. Go for obligatory first walk on the beach… no big excitement except for the dramatic temperature change from -27 to +27. …but on the second day – New year’s Eve – or Old Years Night, as they call it here… whatta great start to the vacay! The surf was (and still is) quite rough in front of the Seafoam Haciendas so we wandered along the Hiway to Accra Beach where the surf was a little tamer. Kids loved it and so did we, of course. Bobbed in the water, got a few mouthfuls and eyefulls af the briny sea, and got a little burned (well, I did… the kids were wearing SPF 1,000,000, of course). But the real hi-light of the day was to the Barbados Yacht Club where we met up with some old and dear friends for lunch! Nice setting and great food.1 Then for some great swimming on the beach directly in front of the Club. it was far calmer than either of the beaches in our corner of the island. Around mid-afternoon, our friends brough us back to their bungalow directly situated on the beach beside the Club. We were treated to a fine authentic Bajan dinner, great conversation, great fireworks, and met some new and amazing people on the way (many, MANY thanks to Richard… who drove us back to our digs after the festivities were over… quite a detour for him and we appreciate it and hope to pay it forward someday soon ). A great start to the new year and a great end to the old. Oh, and J? Yer Dad will NEVER let you forget the JR incident. 1. If ever at the Barbados Yacht Club, try the fish cakes! Incroyable!